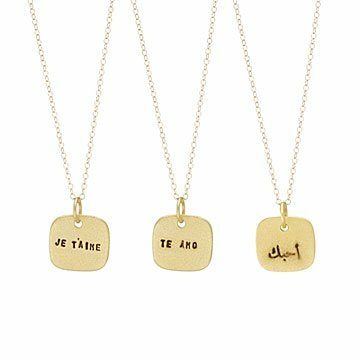 Say "I love you" in one of seven languages with Christine Street's handmade pendant. A moonlit gondola ride. Champagne under the Eiffel Tower. A stroll hand-in-hand across an Irish knoll. Sometimes you can't put love into words, but when you do, do it beautifully in one of seven languages with Christine Street's sweet design. The sterling silver plaquette features a heavy plating of 14k gold and is embossed with "I love you" in French, Spanish, Arabic, Hebrew, English, Gaelic, or Italian. It's a delicate keepsake that lays close to your recipient's heart wherever they may go. Handmade in California. Wipe with cloth; may use Silver polish or tarnish removers. The best care for your necklace is to wear it often. When not being worn, store in a closed container of some sort., ie… plastic bag, jewelry box, non-wool cloth. Avoid wearing in chlorine. Your necklace may be cleaned using a mixture of warm water (1 cup), baking soda (1 tbl) and salt (1tbl).